I thoroughly enjoy Eurobike, it’s everything a trade show should be – fun, located in a great location and (relatively) affordable. Pretty much everything Interbike isn’t. 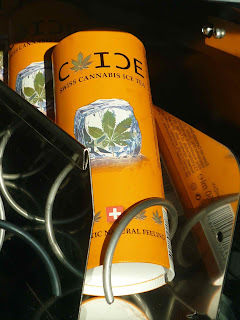 Located in the small city of Fredrichshafen in southwest Germany and along the coast of beautiful Lake Constance/Bodensee. The venue (“messe”) is spread out amongst about 13 large buildings and comprises just over one million square feet of exhibits. Even getting there is fun (aside from sitting for seven hours in coach from Dulles(t) to Zuich). 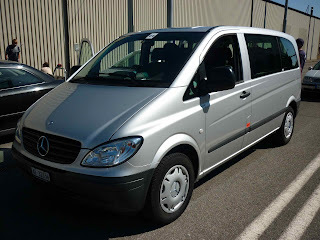 Once we landed we grabbed a rental car – or more accurately a Euro van. The Mercedes Vito would fail miserably in the US. No dual-sliding doors, one skimpy cupholder, designed with a t-square and underpowered by a buzzy 109 HP diesel engine with a six-speed manual transmission. All-plastic interior with a hard-surface floor. No in-car entertainment system. Heck, there wasn’t even an auxiliary input for my iPod, so we listened to Swiss radio where they still talk over the beginnings and ends of songs. Even though it was a stripper model, it was still a blast to rail around the German countryside with. 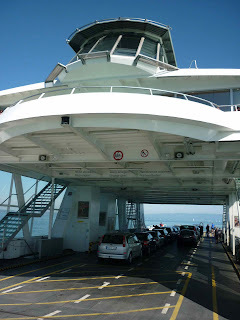 But before we got to Germany we had to drive from Romanshorn, Switzerland on the western coast of Lake Constance to grab the ferry to Friedrichshafen. The ferry ride is a super-relaxing ride across the lake, taking about 40 minutes. Modern and with a bretzel-und-bier-equipped snack shop up top too. BTW, taking the train from ZUR to the show is quite easy. You go down two floors at the airport and you're at the train station from which you can go pretty much anywhere in the entire country. 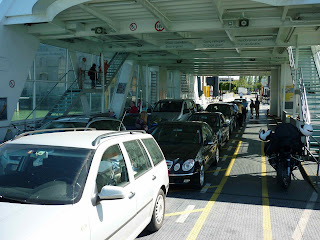 You take the train to Romanshorn and you get off right by the ferry. It's the way travel SHOULD be. Such a shame that you can't do that anywhere in the US that I'm aware of. Someone please prove me wrong. Have fun. Hopefully I'll go next year and we can have a Heffeweisen together!